How unwavering is the peace agreement with HPC-D? Insurgency-ravaged northeast saw signing of another peace agreement on April 2. The Zosangbera faction of the Hmar People’s Convention-Democratic (HPC-D) and the Mizoram Government signed the Memorandum of Settlement (MoS) after six rounds of talks. The talks began on August 10, 2016. The HPC-D decided to bring an end to the armed struggle after the Mizoram government agreed to the formation of Sinlung Hills Council, which means the Hmar tribe would now get more administrative autonomy. The MoS was signed by Chief Secretary Arvind Ray on behalf of Mizoram government; and HPC-D-Zosangbera ‘president’ H. Zosangbera. As many as 112 insurgents on April 13 laid down arms before Mizoram home minister R Lalzirliana at Sesawng, about 40 kilometres from Aizawl. The surrendered arms included sophisticated A1 sniper rifle, AK series assault rifles, 9 mm pistols and carbines. 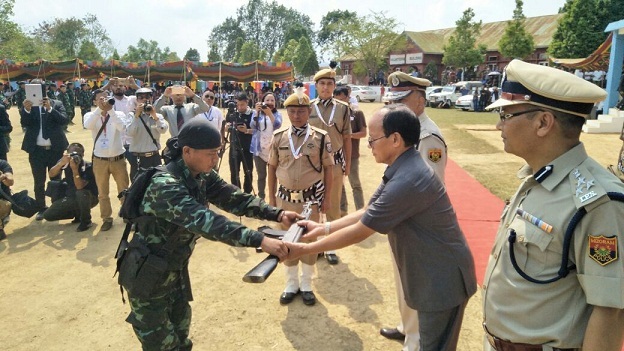 Euphoric with the surrender of the HPC-D cadres, Mizoram Chief Minister Lal Thanhawla thanked them for joining the mainstream and said rebellion and disturbances are hindrance to development. The CM said HPC-D joining the mainstream will usher a new chapter of development in the Hmar inhabitant areas. He also said the quality of surrendered arms reflected the sincerity of the HPC-D cadre and their leaders. Soon, the Mizoram State Assembly will pass a bill for formation of the Sinlung Hills Council. The council will comprise 14 members, of whom 12 would be elected, and two nominated. The council will be headed by a Chief Executive Member. The council will have administrative autonomy to carry out developmental works in 31 villages in three assembly constituencies –Chalfilh, Tuivawl and Serlui. In fact, this is the second peace agreement with the HPC. Earlier, a similar agreement was signed on July 27, 1994, and the Sinlung Hills Development Council (SHDC) was formed. More than 300 Hmar insurgents had laid down arms with the hope that their demands were met in totality. Unfortunately, the agreement soon ran into rough weather because the Mizoram government did not implement the accord in totality. 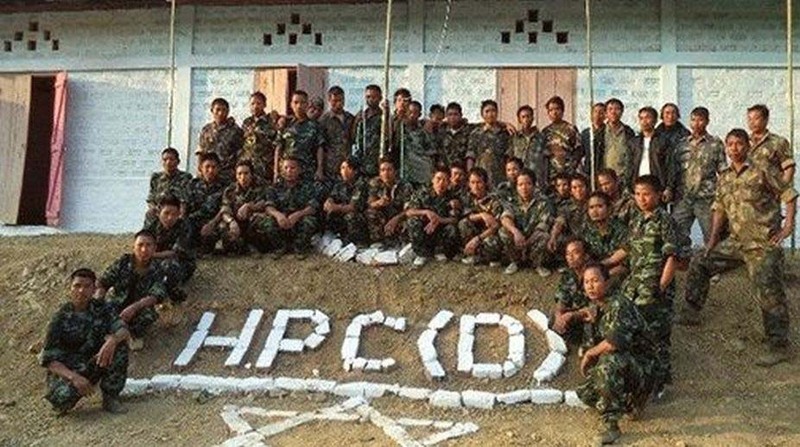 Following the failure of the accord, a faction of the Hmar insurgent outfit continued with the armed struggle as HPC-D. The main demand of the group was granting of Sixth Schedule status to the Hmar areas. Frustrated with the progress of the movement, HPC-D president Lalhmingthang Sanate decided to merge the outfit with the Kuki National Organisation (KNO) in September 2011. But, another HPC-D leader H. Zosangbera decided to continue the armed struggle and decided not to join the KNO. Lalhmingthang Sanate was arrested by the Assam Police on February 21, 2018, on charges of murder of Nobar Sanate, Finance Secretary of the Zosangbera faction of HPC-D.
Also read: Why not a separate time-zone for the Northeast? Since the second agreement has been signed with Hmar Peoples Convention (HPC) after 22 years, there is definite uncertainty about the implementation of the peace agreement. A section of Hmar intellectuals are sceptical about Mizoram Chief Minister Lal Thanhawla’s sincerity in implementing the peace accord in totality. Some of the Hmar intellectuals, who refused to be named, raised questions as to how the new Sinlung Hills Council (SHC) will be different or better than the erstwhile Sinlung Hills Development Council (SHDC). Moreover, since the new council will not be created under the Sixth Schedule of the Constitution, it will have limited influence. The weakness of the peace agreement was felt on April 4 when Zosangbera faction of HPC-D claimed though its movement was initially confined to Mizoram, there is immediate need to safeguard the interests of Hmars in Manipur and Assam as well. There are more than 70,000 Hmar population in Churachandpur district of Manipur and about 30,000 Hmars in Dima Hasao district of Assam. As the Hmar Peoples Convention initially has been demanding for a Hmar State at the tri-junction of Assam, Manipur and Mizoram, the signing of the April 2 agreement may not be the end of the statehood movement. There is every possibility that the statehood demand may launch again and the peace in the area may again be disturbed. For more than three decades, the HPC has been taking advantage of the difficult terrain and has been carrying out its armed struggle. Secondly, it will also be important for the Mizoram government to initiate peace process with the Sanate faction of HPC. As the Senate faction is determined to get the Sixth Schedule status, it will be wise on the part of Lal Thanhawla-led government in Mizoram engage the other faction in talks to guarantee total peace in the area. HPC-D has a lot of striking capabilities. Since its formation, the outfit aligned with several insurgent groups active in the northeast. It maintained a cordial relationship with the National Socialist Council of Nagaland (NSCN), which allegedly provided it with arms and training. It has also carried out attacks with the support of the Manipur-based outfit, the People’s Liberation Army (PLA).